I was feeling guilty for getting behind in posting the interviews with advocacy organizations during Epilepsy Awareness Month but it dawned on me that highlighting these outstanding organizations is not only important during the “official” awareness month but also beyond. The importance of spreading awareness and education about epilepsy doesn’t stop just because the calendar turns to December. I am fortunate to have connected with such worthy organizations and feel honored to be able to bring you the interviews with the people who are the passion and drive behind the organizations. 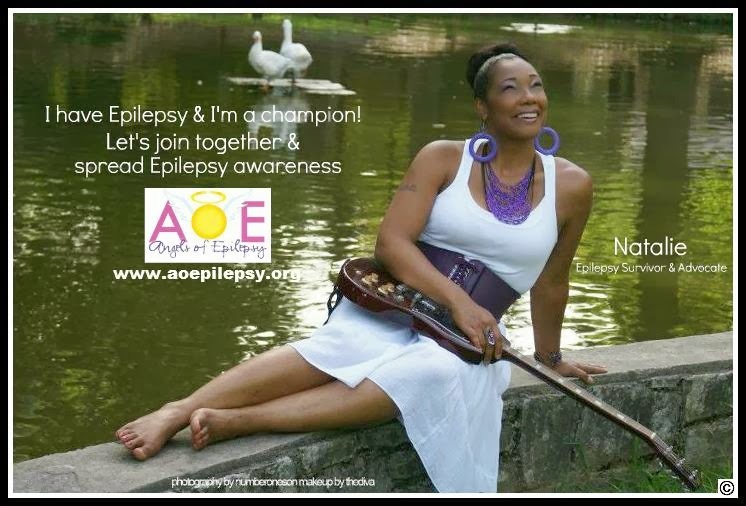 Natalie Y. Beavers is an epilepsy survivor, an advocate, and founder of the “Angels of Epilepsy Foundation” in Atlanta, GA. She is a proud mother of her two sons and work hard interacting with many epilepsy patients, as well as spreading the awareness to get more people educated and involved in supporting epilepsy awareness. Being hospitalized for months dealing with testing, Natalie had two craniotomies (brain surgery) in 2008. Even though she has had the brain surgeries, it did help decrease her episodes but due to the cyst that’s still on her brain, she has seizures from time to time. Natalie is now writing a book about her life. From her childhood experiences, becoming a single-parent, battling with epilepsy and her life as it is today. There will be many shocked about this story because Natalie is telling real-life experiences that many never even knew or couldn’t even imagine. ** To read more about Natalie’s story and information about her foundation, visit www.aoepilepsy.org. Natalie implores us to SUPPORT EPILEPSY AWARENESS! Robert’s Sister: Tell us the name, mission and goals of your organization. Angels of Epilepsy is a non-profit support foundation and advocacy that deals with many epilepsy survivors and their families in Georgia and around the world. AOE assists and provides educational information, visits to patients, and much support in many of their needs. Our main goal is to continue to spread epilepsy awareness and get more people involved and educated about it. But AOE achieves our other goals just being there for epilepsy survivors and showing our love and support for them and their families. Robert’s Sister: When was your organization founded and what was the catalyst for forming the organization? Angels of Epilepsy was founded in 2008 when I was going through testing at Emory University Epilepsy Hospital in Atlanta. Spending many weeks there, I met many epilepsy survivors and their families. And I was so shocked just to know that there were so many other people out there who are just like me. We talked and cried together, and discussed how epilepsy really is in our lives. So I wrote a lot while being there and I thought about starting an organization that can and will help those living with epilepsy. AOE was organized right before my first brain surgery in 2008. Robert’s Sister: What do you see as the greatest need for epilepsy awareness or advocacy and how do you help fulfill that need? I feel the greatest need for epilepsy awareness should be for many others to be educated and know about this medical condition. It will help the many of those battling with epilepsy for others just to show much support. The letters and e-mails that we receive from survivors or their families, encourages me and my organization to get more involved in their lives and to help their stories to be heard. I will also be coming out with a book about my life story, and how I faced so much living with epilepsy. Also, in November, I will release a journal book for epilepsy survivors that will help them in so many ways. Living with epilepsy myself, I deal with short-term memory loss and I have to write a lot. So I’ve created a book, called “My Seizure Diary.” In the book, there are pages that survivors can write down the date of their episode, type of seizure that happened, descriptions, and questions or concerns they can write to ask their doctors. In this book there is also a journal where they can just write some of their thoughts. This book will also be great for parents dealing with children so they can write down their children’s episodes and questions for doctors. Robert’s Sister: What do you want people to know about epilepsy and the people you are working to help? I would like for many people to know that epilepsy affects millions of people around the world. It is not a disease, it’s a medical condition that deals with the brain. There are many people living with epilepsy that need attention. There are so many stories from those living with epilepsy and we just want them to be heard. AOE is dedicated to support and just to be there for the many battling this medical condition, and helping them live a normal life. Robert’s Sister: What are some events your organization hosts in order to raise funds and awareness? Angels of Epilepsy has events throughout the year. We have monthly meetings with epilepsy survivors and their families. We have our "Purple Pastry Party" a few times throughout the year. And in November, which is Epilepsy Awareness Month, we have our annual awareness celebration. At these events, we provide educational information about this medical condition and resources that could help in many ways. All donations and proceeds are for special gift-baskets for epilepsy patients at Emory University Epilepsy Hospital and Egleston Children's Hospital here in Atlanta, and for many survivors in other states. We also provide needs for their families as well. Robert’s Sister: Tell us about your successes! Angels of Epilepsy has been successful in many ways. We’ve put so many smiles on patients battling with epilepsy, as well as their families. We provide information and a lot communication with them. Just sending letters and gifts to them and to see the reactions, makes my foundation work even harder to advocate and support even more for epilepsy survivors. 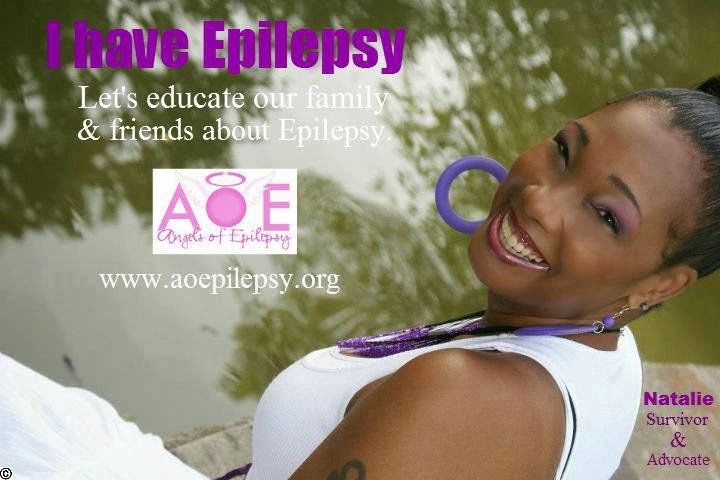 AOE is also hoping that the book we’ve created, “My Epilepsy Diary,” will help and encourage the many living with epilepsy. Robert’s Sister: How has epilepsy and your organization affected your life? I’ve battled epilepsy for many years and it has affected my life in many ways. But I’ve learned to turn the negative into positive! We all go through things for a reason so I am just living day by day and following my journey to help and inspire those who are just like me living with epilepsy. Meeting and communicating with those battling this medical condition, just gives me motivation to advocate and support epileptics, and definitely spread awareness. Robert’s Sister: Please tell us what your involvement with your organization means to you. Has this affected your own personal purpose? The involvement with my organization means so much to me! Just to be there for the many just like me battling epilepsy means a lot to me and them too. The communication I have with patients and their families affects me in many ways because what they are going through helps me to see what my own family deals with when it comes to me. Living with epilepsy is a journey that many need to know about and that’s why I am doing everything to help the survivors and tell others my story. Robert’s Sister: Is there anything else you want us to know? I would like to get a law passed. Me being involved in that tragic accident that happened years ago, and some of the things I experienced from that, as well as knowing there are similar stories like mine, I want to get a law passed that will have better communication with doctors and patients when it comes to driving privileges. Still working hard on that but I know there is a lot more work to do on that particular goal. Robert’s Sister: Please tell us how we can contact and support your organization. Angels of Epilepsy Foundation is located outside of Atlanta, GA. All of our information is located on our website at www.aoepilepsy.org. I would like to thank Natalie for her time and for everything she does to bring comfort to the families of those dealing with epilepsy. I look forward to reading her book and knowing more of her personal story. Thanks, Natalie!